Your doctor may suggest taking a urine sample in order to help diagnose or rule out certain health conditions, including kidney disease, urinary tract infection, hydration, diabetes, and infection. Urine removes filtered waste products from the body, and will always contain a typical range of certain substances. 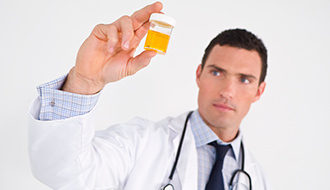 If your urine test reveals anything unusual, this will help your doctor to diagnose any underlying health conditions. Glucose in the urine can indicate type 2 diabetes. Varying levels of protein in the urine can indicate kidney disease. Urinary tract infections, STIs or pregnancy will also all show specific changes in the urine. Your doctor will discuss the results with you during your consultation. You can also take your emailed results to your own GP for further analysis, if you wish. To ensure a proper follow up and management of your condition, a consultation or a doctor’s request is required. Our doctor will give you a call to discuss the results and next steps in treatment with you and we will email you the results afterwards. If the test is requested by a different clinic, we will email you the results and you can take them for interpretation to your own doctor. How is mid-stream testing different to a regular urine test? In mid-stream urine testing, the first and last parts of the stream are not tested, thereby reducing the risk of contaminating the sample with bacteria from either your hands or the skin around the urethra. The MSU test identifies which bacteria are responsible for an infection, and which antibiotics will be able to treat it. Other than arriving for your test with a full bladder, the best thing to do is tell the doctor about any medications you are taking, as these can affect your test results. Also tell the doctor if you are menstruating, as this may lead to the presence of blood in your sample.